Microsoft previewed the first major upgrade to Windows Live Essentials for Windows 7 late Wednesday. Windows Live Essentials is a suite of free programs, including Photo Gallery, Movie Maker, Messenger, Sync, and Mail. Microsoft says the tools have over 500 million daily users. Photo Gallery now adds facial recognition and sorting to existing tools like quick Auto Adjust and Retouch. Another new feature, Photo Fuse, lets you take the best parts from similar pictures and fuse them together. Movie Maker now has “AutoMovie” themes, which lets you easily apply snazzy themes, visuals, text, and other effects to your movies. You can then export your videos in HD formats--another new feature. You’re also able to share videos across Flickr, Facebook, and other sites. 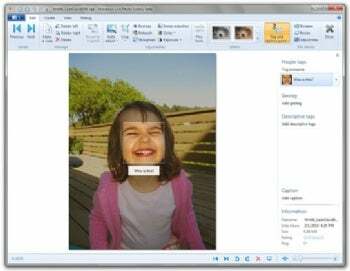 Facial recognition automatically finds and tags people in your photos. The Email program lets you manage multiple email accounts, calendars, RSS feeds, contacts and newsgroups all in one place. New features include: sending up to 10GB of photos per email, instant messaging in the inbox, conversation threading and more. You can also use the Sync feature to automatically sync an updated folder from one computer to another when they’re turned on. Using the new remote desktop feature, you can also sync to other computers via an Internet connection, or view files on another computer from a remote device. If the computers are turned off, you can store the information online and the computers will sync when they are turned on. While the new versions of the Windows Live Essentials applications aren't ready for download yet, they will be available in the not-too-distant future at http://download.live.com. Updated 6/3/2010 at 6:36 PM PDT to clarify that the new Windows Live Essentials software is not yet available for download.